After reading the description of this book I was excited to dive into it. I was expecting a unique Christian perspective on complex social issues such as war, economics, euthanasia, and homosexuality. Different Eyes, though, is not the book of answers that I was expecting. It is a book about how to find the answers for yourself. Different Eyes is a pleasant surprise. The book begins with a revealing examination of biblical holiness. This discussion of holiness then transitions to a detailed looks at ethics and morality. Most Christian discussion of morality, ethics, and holiness revolve around particular issues. Teachers continually attempt to bolster their position by citing particular biblical texts or themes. This type of teaching is an attempt to get the the listener to agree with the teacher. 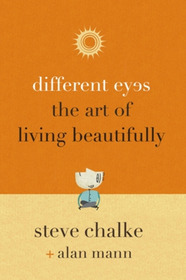 While Different Eyes does address specific issues, the book does not try to convince us to take any particular position. Rather, it encourages us to examine these issues within the the biblical idea of holiness, the biblical narrative, and the community of the church. This is a refreshing perspective. Throughout the book the authors equip us for this moral examination and then challenge us to apply it by presenting divergent positions on a variety of issues (war, the use of wealth, homosexuality, and euthanasia). Each section concludes with several questions that make this an excellent book for a discussion or study group. One of my favorite parts is a discussion of the “What Would Jesus Do?” concept in relation to contemporary issues. “Would Jesus be for or against stem cell research? Would Jesus be for or against birth control? Would Jesus negotiate with terrorists? Would Jesus speak at the local mosque if invited? Would Jesus join a multi-faith discussion? Would Jesus join a trade union or strike for more pay? Would Jesus drive a car, and if so, which one? Would Jesus drink beer, stick with red wine, or re-evaluate and go tee-total? Would Jesus vote? Who for? Why? Would Jesus offset his carbon footprint? Would Jesus turn off his phone in a prayer meeting? Would Jesus complain about media mis-representation? Would Jesus train as a clergyman? If so, for which denominations?” The book reveals the futility of asking such questions, but still allows us to be challenged by them. Even though some of this book is technical and examines complex philosophical and theological issues, it is still accessible to the average reader. At 176 pages, with a rapid pacing, it is a fairly easy read. The author, Steve Chalke, has stirred a bit of controversy with some unorthodox ideas about God, the Bible, and the church. While Different Eyes does not make any radical statements that might stir his detractors to action, we can see some of Chalke’s less conservative ideas poking through. Chalke understand the Bible as a progressive revelation of God rather than a book of literal instruction. He also views the work of Christ as more about the restoration of all things than redemption from sin. Even if these ideas differ from your theology, Different Eyes is a revealing and challenging book that will help you understand moral issues in a new way.